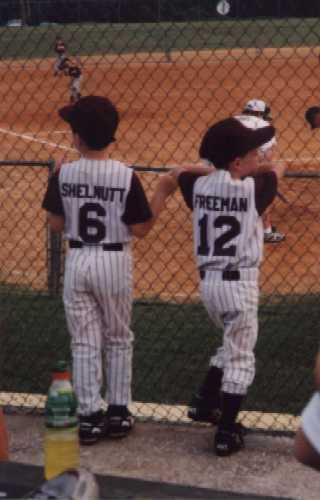 Welcome to the Gardendale Tee Ball 1998 All Stars Home Page. 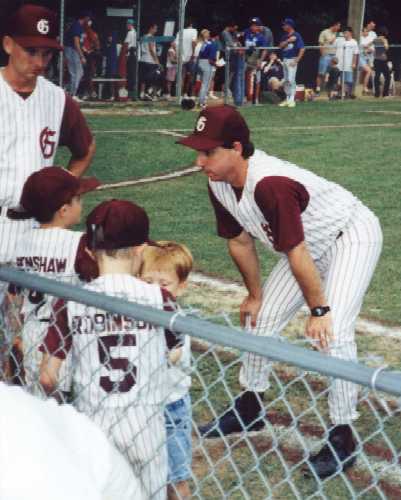 Mark Freeman is the Head Coach. Assistant Coaches are Win Crowder, Mike Edwards, and Lloyd Bush. The Team was undefeated through the Warrior Invitational Tournament, the District Tournament, and the State Tournament. 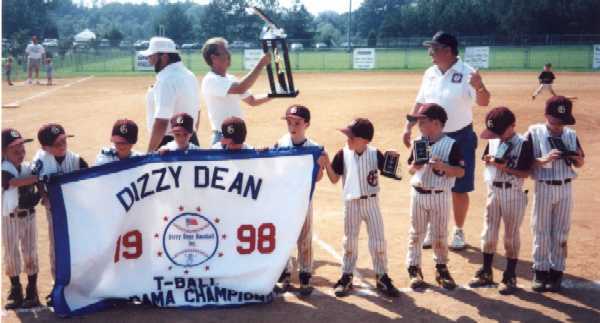 The Gardendale All Star Team is proud of winning the State Tournament and bringing a State Tee Ball Championship to Gardendale. The Boys and the Coaches have really worked hard. In the first game of the State Tournament, Gardendale played Center Point, perhaps the strongest team we had seen so far. It was an important win and the Gardendale All Stars were poised when Center Point came back in the 4th inning and tied it up. While our bats were somewhat off, the defense rose to the occasion and played hard when it counted. The final score was Gardendale 14 and Center Point 11. Gardendale played Northport in the next game. Another come from behind win shows the stuff these boys are made of. They never gave up. The bats got to working late and the defense was great again when the chips were down. The final score was Gardendale 17 and Northport 12. After two days of being rained out, the State Tournament finally got started again. Gardendale defeated Walker County 15-10 in a pretty good game. In a game of the two unbeatens, Gardendale and Park West, Gardendale won by a score of 20-10 and advanced to the championship game. 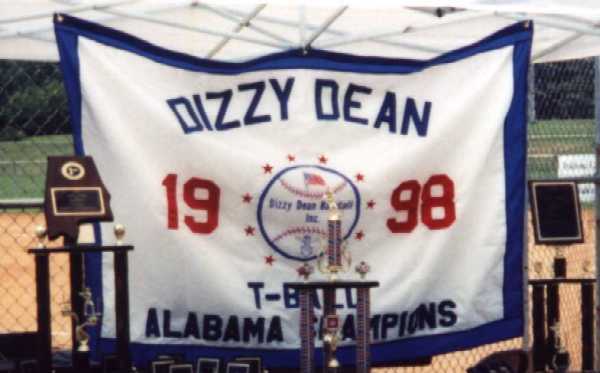 On Sunday July 19, 1998 in a hard fought game and the scorching heat, Gardendale defeated Walker County 17-16 to win the 1998 Dizzy Dean State Championship. Please check back as this site will be updated to include pictures of the Players, Coaches, and Families. This site will remain as a tribute to the fine young men and Coaches that made up this team. Much thanks goes out to the Coaches who have dedicated their valuable time to guide this team to the State Championship. The Parents, Grandparents, Brothers, Sisters, and other Family Members have all been super. 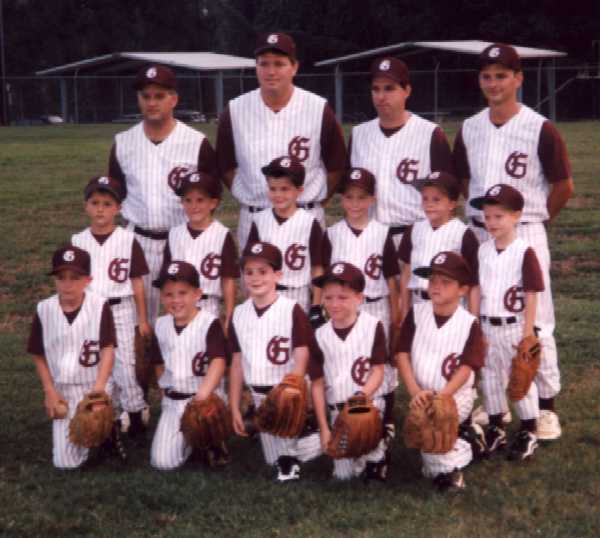 All of Gardendale is proud of the 1998 Gardendale Tee Ball All Stars, the new State Champions. There have been visitors since July 1, 1998.